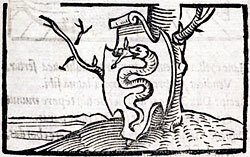 Alciato at Glasgow: Emblem: INSIGNIA DUCATUS MEDIOLANENSEM. Insignia of the Duke of Milan. Est gentilitiis nobile stemma tuis. Vidimus, hisque suum concelebrare genus. Divini & sobolem seminis esse docet. An quia sic Pallas de capite orta Iovis. An infant bursting from the maw of a coiling serpent marks the noble lineage of your clan. We have observed that the Pellaean king had coinage with such a device and by it celebrated his own descent, proclaiming that he was begotten of Ammon, that his mother was beguiled by the form of a snake and the child was the offspring of divine seed. The infant emerges from the mouth. They say that some snakes come to birth that way. Or is it because Pallas sprang like this from the head of Jove? 1. The Sforza family had ruled Milan since 1450, having assumed power through marriage (some said fraudulently) to a Visconti heiress, and taken their symbol as their own. They were chased out in 1499 by the French, but restored several times. 3. For the superhuman birth of Alexander, see e.g. Plutarch, Life of Alexander, 3 and 27: Jupiter in the form of a serpent mated with Olympias, wife of Philip of Macedon, and begat Alexander. Ammon, a north African deity, was identified with Zeus/Jupiter. When Alexander visited Ammon’s sanctuary, he was hailed as the son of the god. 4. According to e.g.Pliny, Natural History 10.170, Aelian, De natura animalium 1.24, the viper, alone among snakes, produces not eggs but live young. See also Isidore, Etymologiae 12.4.10. 5. The story of Pallas Athene springing complete and armed from the head of Jove is found in many sources; see e.g. Homer, Hymns 3.308ff; Hesiod, Theogony 923ff.